Please create your own account to log in to this system. Click here if you are a parent or student who wish to access our Adaptive Learning System. you can register to access to all features of our Adaptive Learning System for $9.95 for all your students of any selected grade valid through 06/30/2019. The Math League Contests (www.mathleague.com) are designed to build student interest and confidence in mathematics through solving worthwhile problems. Over 1 million students around the world participate in Math League Contests each year. Every contest has questions from different areas of mathematics, suitable for the grade level indicated. The questions range in difficulty from straightforward through moderate to challenging. 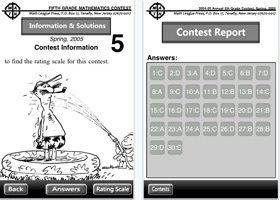 Many students first develop an interest in mathematics through problem-solving activities such as these contests. The system can quickly help improve your students' performance on annual Math League Contests and increase their chances to qualify for the annual Math League Summer Tournament. The system can provide your students with a personalized learning environment where they can learn at their own pace and measure their own progress. The system allows your students to do practice work and to complete instructor/parent-assigned tests and homework assignments online. Based on their results, it builds individual study plans that your students can use to improve their math fundamentals and skills. It can tailor learning to your students. Repository of questions: The system contains all the questions from the following Annual Math League Contests since 1977. The system facilitates parents to participate in their children's learning process so they can understand and assist their children along the way to accomplish goals. The system keeps track all the questions a student didn't answer correctly. We call this the "mistake list" of a particular student. A student can always check his/her "mistake list" and work on the questions again. The system can also generate "similar questions." Question A's similar questions are defined as the questions which have the same topic as that of Question A and the same level of difficulty. The system can conduct analysis of a student's performance over a particular period, for example, the last two months, identifying the topics he/she has mastered (strengths), and the topics he/she needs more work (weaknesses), and generating questions for this student to improve his/her weaknesses. Please check our FAQs at https://online.mathleague.com/faq/faqteacher.php for more detailed description of the system. No part of this system may be reproduced or transmitted in any form or by any means, electronic or mechanical, including photocopy, recording, or any information storage or retrieval system, or any other means, without written permission from the producer.